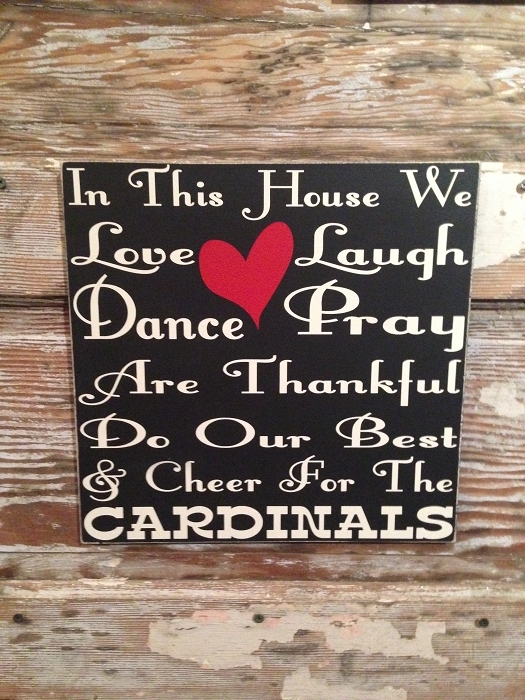 In This House We Love, Laugh, Dance, Pray, Are Thankful, Do Our Best & Cheer For The Cardinals. Great addition for any Arizona Cardinals Fan! As Pictured, Black sign with Off White lettering & Red Heart. This sign is hand crafted and painted with care. No vinyl was used in the production. Extra time is taken to ensure your painted sign with design and/or lettering comes out crisp. Our signs are proudly made in the U.S.A. Thank you!! On time and it's perfect!! This is a great gift for football fans! In This House We Love, Laugh, Dance, Pray, Do Our Best & Cheer For The Packers. Customized with Family's Last Name.